As soon as I signed up for the workshop with Patricia Walden, I began to worry. This devoted senior student of B.K.S. Iyengar advertises herself as a teacher of classical Iyengar yoga, which I take to mean purebred and by-the-book, with no wiggling or straying from the party line. While my yoga roots sprouted in this strict and rigorous approach, in recent years I've been inspired by softer and more organic styles of yoga. So I wasn't too sure how ready I was to dive back into a world of "two blocks, one bolster, a strap and a chair" for an entire week. I signed up for this workshop with my lovely and spirited yoga friend Deborah, who doesn’t share my love for dancing dogs and wiggling warriors, and therefore wasn’t the least bit apprehensive about the trip. I agreed to join her only when she promised that if the yoga was a total bust, we’d still have a lovely time. How could I say no to a summer reunion with a far-away friend on a bird-happy and flower-filled ranch in southwestern Colorado? I breathed a big sigh of relief when we wandered into the yoga hall on that Sunday morning in August and found Patricia settling onto her mat while holding a familiar green book of poems by Mary Oliver. I feel an immediate kinship with anyone who would carry that book into the mountains - especially the Colorado mountains, where I first heard Mary Oliver's words. Even if I didn't end up liking her yoga, I knew already I was going to like Patricia. With the La Plata mountains shining behind her and a fresh breeze billowing through the crowded hall, Patricia opened our week with a few words about a past attendee of this workshop who had died in a car accident just weeks before. Patricia read to us these words by Mary Oliver: "To live in this world you must be able to do three things: to love what is mortal; to hold it against your bones knowing your own life depends on it; and, when the time comes to let it go, to let it go." And then Patricia told us she hoped these words would guide our exploration through the week. I smiled and felt myself softening when I heard this. I began to wonder whether maybe I was just where I needed to be after all. I wanted to know just how this soft and heartful woman was going to teach us about letting go during a week of hard-core yoga. And make no mistake about it, this was a full-blooded Iyengar workshop. Our mornings began with at least three hours of methodical and challenging asana practice - standing poses one day, backbends the next, then arm balances, more backbends, and so on. Our afternoons were filled with an endless parade of inversions, complete with spine-wringing variations. 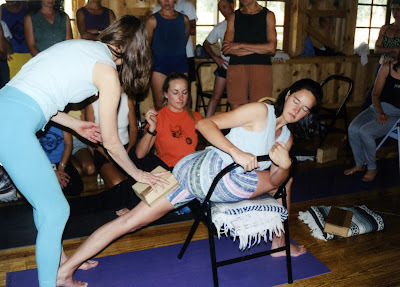 In true Iyengar fashion, our classes included enough instructions, lines, actions, double actions, blocks, straps and chairs to make an engineer swoon. I'm not an engineer. I quickly lose interest in the precise action of my upper outer groins. I cringe when I hear the words, "Go get a chair." And nonetheless, yoga with Patricia felt really, really good. No matter how demanding our classes were in Durango, Patricia managed to invite a lightness and approachability to the room. She was tough when she needed and yet never let us go too long without a good laugh. She invited a lovely warmth and kinship among all the workshop participants, and opened lots of doors and windows for personal experience within the asanas. Never in a million years would I call Patricia Iyengar-light. But I would call her Iyengar-tender. Sometimes she started off the class reciting poetry in that same soft and whispery voice from her videos, the one that always reminds me of Jackie Kennedy giving TV tours of the White House. While we worked our way through the asanas, she told us "a pose is like a symphony" and then asked us to "let the pose be beautiful." She invited us to let our exhalations be tender, and reminded us over and over that "your body is your home." During savasana she sometimes chanted sutras or scriptures as she wandered around the room in her swishy silk capris. Patricia even managed to sound nice while chastising a student for having poorly folded blankets ("Sloppy, sloppy, sloppy," she whispered with a smile.) And when her voice turned deep and demanding, she could still pull off a laugh. "You have to work," she exhorted, as we gazed toward the glorious mountains. "This is a yoga intensive, not a vacation!" I must admit, for the first few days in Durango I felt a little uncomfortable - like a lost mongrel who'd stumbled onto a pack of purebred hounds. Most of my fellow students were die-hard Iyengar devotees. 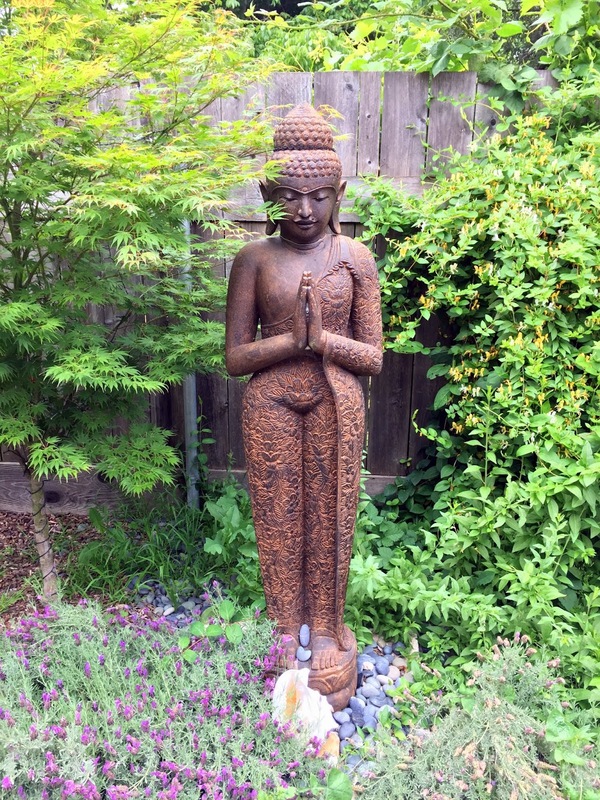 While my initial yoga training was clean and clear Iyengar, in recent years I've fallen blissfully into the arms of teachers like Angela Farmer and Barbara Benagh, who offer more organic and internally-directed approaches. I’ve grown infinitely more open, breathable and joyful since they've taught me how to dive deeply back home inside. And yet that hasn't stopped me from occasionally studying with some of the strictest Iyengar teachers of them all. Just like my two territorial cats who stalk and snarl when they get too close to each other, my love of form and longing for freedom have been a somewhat volatile mix. My friends sometimes roll their eyes at me, and even I frequently wonder what I'm doing. Am I unable to commit? Slightly schizophrenic? Just a yoga junkie who will say yes to anything? Or am I simply finding my own way? To my surprise, our week in Durango offered an important opportunity to watch these competing leanings finally begin to play together. Again and again Patricia brought us back to the theme of integration, to experiencing the asanas from a deeper point of wholeness within. With all of the technical instructions in Iyengar yoga, I sometimes feel reduced to a machine with a thousand separate parts. But Patricia asked us to make room for something more. When we reached the endpoint or "mountaintop" of an asana, she said we should let go of all the instructions and simply reflect, watch, integrate and be. "Surrender to the pose without losing its form," she told us as we moved through a flowing series of asanas. "A pose is a creation not an accomplishment." I was delighted to see that even though I don’t spend too many mornings anymore climbing the ladders of impossible asanas, I was able to shimmy into even the ominous ones without too much drama. Within the most challenging poses, I still found myself able to breathe and feel and smile with some measure of ease and joy. This was a big gift - seeing that even within the tightest spot possible I could still find freedom inside. I began to see that I could take the larger, wilder exploration I'd learned so much about in recent years and channel it into even poses that offer no wiggle room at all. With her open and affirming spirit, Patricia offered a large enough container for me to explore and experience this, while firmly within the walls of an Iyengar setting. All this meant that sometimes in class I gave up seeking the "moons of my feet" or the "pillars of my chest," and sought my own imagery and guidance within. While the rest of the class focused on some double-action or micro-movement, I’d discover children cartwheeling in the center of my chest, or suns spiraling through every cell of my body, or the Rocky Mountains settling into my feet, or the vast Colorado sky floating between my ears. I felt a little sneaky about this until one day Patricia said, "When you've reached your limit, tune me out." When everyone laughed, she told us she was serious, that there comes a point when we need to let go of instructions and grow quiet and surrendering within. I deeply appreciated this chance to simply rest in the pose without rules, words or effort. An important aspect of this integration is personal exploration, and Patricia opened doors here, too. Over and over she asked us to test the rules in our own bodies, reminding us that "the rules are not etched in stone." She warned us to be careful when taking on a new instruction, since we tend to overdo new actions when we first explore them. When asked where to put a blanket roll when doing a backbend off a chair, she responded, "Wherever your back needs it most!" I loved that with Patricia I was able to feel nourished, challenged and delighted at the same moment. I loved that I could explore the impossibilities of the asanas and still find wiggle-room within. I loved that I could sit myself right next to a pure-blooded, assessment-bound, note-taking student and never feel an ounce of envy. And I deeply appreciated that I could join an Iyengar workshop after finding a home in a different world, without being scorned by one camp or thrown out by the other. I left Durango with a renewed respect for the Iyengar method and a deep appreciation for the individual exploration Patricia brought to it. I was reminded of the remarkable gifts of the poses and the importance of discipline, discrimination and intelligence. Most of all, I was reminded of the beauty and importance of integrity, both in yoga and in life. Through her example and her teaching, Patricia helped guide me toward that sweet land of integration where we can embody both will and surrender, both discipline and freedom, both strength and softness - all in the same nourishing breath.